These pretty earrings can be personalised to include whichever GemDuo beads you want! 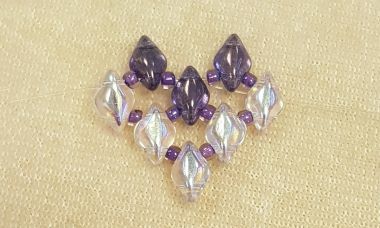 There are approximately 70 GemDuo beads in each 10g pack meaning you can mix and match your colours to make different effects. 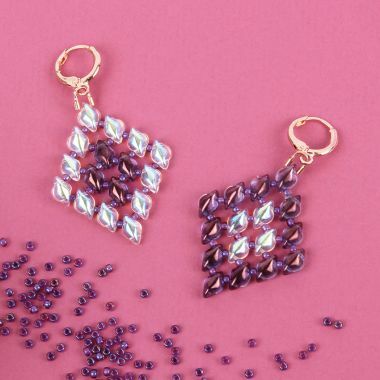 Follow our quick project and learn how make your own diamond shape earrings with plenty of materials left over to make a matching bracelet or some necklace pendants too! Cut approximately 20" of monofilament and thread on the following beads - 1 x gemduo through the bottom hole, 1 x seed bead, 1 x gemduo through the top hole, 1 x seed bead, 1 x gemduo through the bottom hole. Move these to the centre of your monofilament cord. 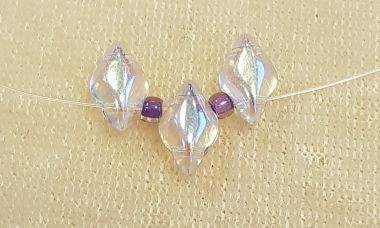 Take the left side of the cord and thread through the top hole of the gemduo bead. Repeat on the right side. On the left, pick up 1 x seed bead and 1 x gemduo through the bottom hole. 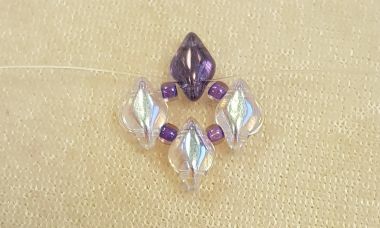 On the right, pick up 1 x seed bead and thread through the same gemduo just added. Pass the left and right threads through to the other side, exiting from the top hole of the two gemduo's on the edge. Onto the left, pick up 1 x seed bead and 1 x gemduo through the bottom hole. Repeat this on the right. Take the left cord and thread through the top hole of the gemduo and pick up 1 x seed bead, 1 x gemduo, 1 x seed bead and thread through the top hole of the gemduo in the middle. Repeat this with the right thread. Thread all the way through until you exit through the top hole of the two gemduo's on the edges. Onto the left thread, pick up 1 x seed bead and 1 x gemduo through the bottom hole. Repeat on the right. Take the left thread and pass through the top hole of the gemduo just added. 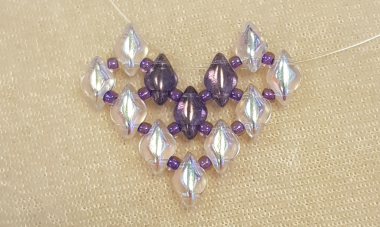 Pick up 1 x seed bead, 1 x gemduo, 1 x seed bead and thread through the top hole of the next gemduo bead. Repeat on the right hand side. Onto the left thread, pick up 1 x seed bead and 1 x gemduo through the bottom hole. 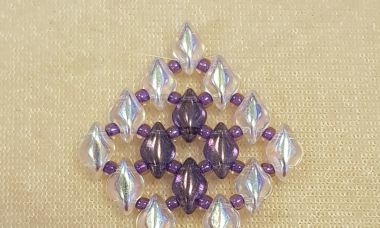 Onto the right, pick up 1 x seed bead and thread through the bottom hole on the gemduo just added in the centre. Thread through to exit through the bottom hole on the gemduos on the edge. Take the left thread and pass through the top hole on the edge gemduo. 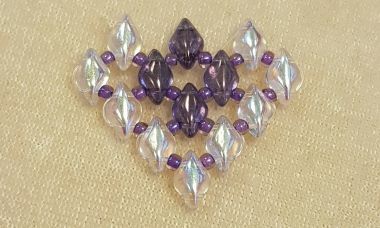 Pick up 1 x seed bead, 1 x gemduo, 1 x seed bead and thread through the top hole of the gemduo in the middle. Repeat this on the right. Thread through to exit through the bottom hole on each gemduo on the edges. On the left, thread through the top hole of the gemduo and pick up 1 x seed, 1 x gemduo. 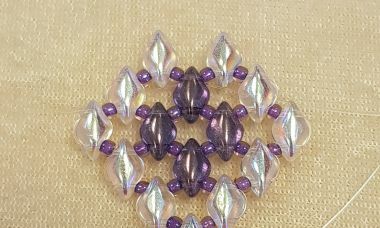 On the right, thread through the top hole of the gemduo and pick up 1 x seed bead and thread through the same bottom hole of the middle gemduo. Take your left cord and thread through the top hole of the top gemduo. Thread through one side of your wire guardian. Thread your earring loop onto the cord and the wire guardian and then thread your cord down the other side of the wire guardian. 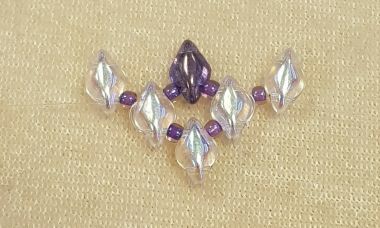 Thread through the top of the gemduo bead in the opposite direction. 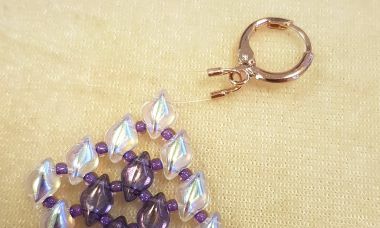 To finish your earring, continue with the cord you're working with and thread it down through a few beads, following the threadpath. 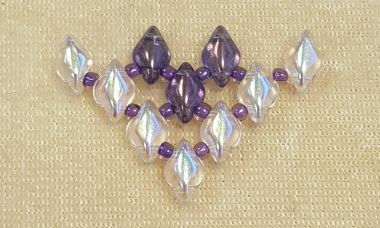 Between a seed bead and a gemduo, make a knot and then continue through a few more beads. Make as many knots as you want to and secure them further with a tiny drop of glue or clear nail polish, applying it from the back of your earring. Repeat this process with your other side of cord and secure it within your design. Once you are happy you're cords won't unravel and your glued knots have dried, trim off the excess cords.